WHAT: Trendy Night Club with Bohemian Style. Hyde Park Café has it all when it comes to atmosphere. A chill outdoor courtyard that separates two indoor sections, one a plush VIP seating area and the other a bumping dance floor that has seen the likes of Michael Jordan, Derek Jeter and Jessica Sierra. WHEN: Fridays 8pm – 10pm. 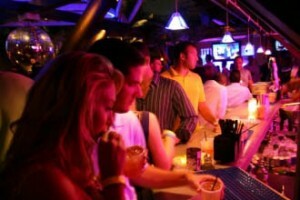 HPC kicks it casual on Friday nights for Flip Flop Fridays. Enjoy laid-back live acoustic rock and an open bar of vodka and select draft beers for just $10. Leave your heels at home. WHY: Because it’s not a café at all. Don’t let the name fool you. Hyde Park Café does not serve coffee. Their drink menu is a blend of signature cocktails, top shelf liquors and over 60 craft, draft beers. WHO (To Take With You): Your friend looking for an excuse to fist pump. Late nights at Hyde Park Café include some of the best techno DJ’s in Florida. And the club is split into three sections so if one DJ isn’t spinning to your liking your options are open for a switch.